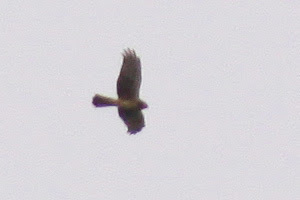 Birding Corvo 2009: Marsh Hawk!? Had a really nice day today! Started at the Lighthouse valley with Fred, Stewart, Vincent, Pierre and Pete. The thought was to do a quick hit and then get out and back to mobile reception as quick as possible. That plan didn't last very long. After a few minutes Pierre picked up a harrier over the mountain that turned out to be a Hen Harrier, but was it a European or an American? 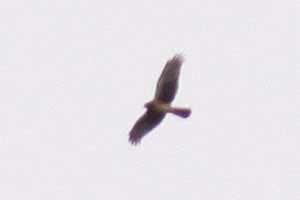 We ran up the mountain after the bird but only got distant views. 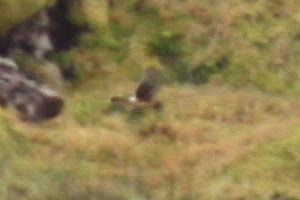 Managed to get some bad record shots and what you can see looks pretty good for a juvenile Marsh Hawk (North American race of Hen Harrier); most important is the dark hood strongly contrasting to the plain body. Pete went crazy and continued running up the mountain after the Harrier while the rest of us kicked around the valley instead. 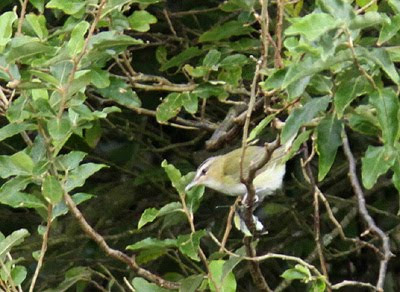 Pierre found a Red-eyed Vireo, probably the same bird me and Simon saw a few days ago. After a while Vincent heard a contact call that reminded him of Common Yellowthroat and after some searching Fred found the bird in a hedge, a young male Common Yellowthroat! Those Yellowthroats are extremely skulky! I only saw the head, but that was pretty cool actually. Good looking birds the males! 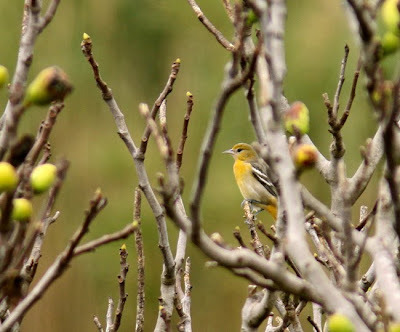 When we had walked back for a while we got news that the Baltimore Oriole was seen again in the village. We were about 5 km away! So guess if we were glad when a car came by and me and Vincent got a ride down to the village! Half an hour later we had gotten good views of the Oriole and went back to the guesthouse to have a chill lunch and wait for the arriving birders; three Swedes, a Belgian and four Brits. Now we are 26 birders on the island! 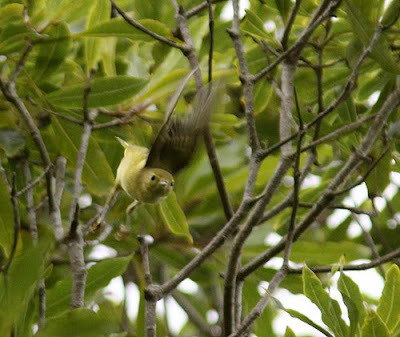 Went up and kicked around Pico and da Ponte in the afternoon which resulted in nice views of the Yellow Warbler. After that had a slow walk back with Vincent. When we got to Ribeira da Lapa a Blue-winged teal came flying out of the tiny valley! Maybe I should add that the biggest pool of water in there is about 5 m long and 1½ m wide. Anyway, the bird appeared to land again so we went in to have a look for it and then Vincent picked up a Red-eyed Vireo instead! Excellent finish to the day! Follow the Eurovision Rare Bird Contest on http://peteralfreybirdingnotebook.blogspot.com/ and also check out Darryls amazing Yellowthroat and other stuff on http://gwentbirding.blogspot.com/. Other birds seen today included: Ovenbird 2, Common Yellowthroat 2 (together in the village), Black-and-white Warbler 1, American Redstart 1, Turtle Dove 1, Yellow-billed Cuckoo 1, Rose-breasted Grosbeak 1 and Indigo Bunting 1. All in all another quite good day on Corvo :) Jobba på! Kul att följa din framfart, Olof! That male Yellowthroat - what a stunner !